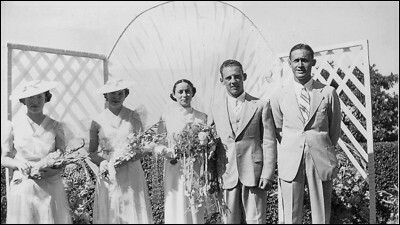 This wedding took place at the Daugherty family home at Edgevale near Phoenix, Oregon on July 11, 1937. From left to right: My aunt Betty Daugherty, my mother Fredene Daugherty, my aunt Carol Daugherty/Acheson (the bride), my uncle Russ Acheson (the groom) and his best man Bill Bowerman. Russ went on to become the Assistant Superintendent of Schools for the Medford School District. His friend Bill became a football coach at Medford High School, a legendary track coach at University of Oregon and eventually co-founded Nike with Phil Knight.